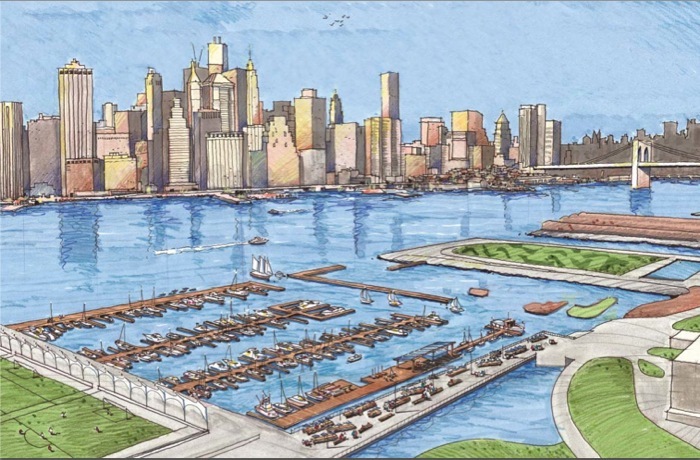 Construction work at Brooklyn Bridge Park will pick up further in 2014, thanks to some recent awards in response to Requests for Proposals and decisions regarding other projects. Edgewater Resources, “a multi- disciplinary marina design, development, and management company with extensive national and international experience,” will develop and operate a marina between Piers 4 and 5 (rendering above by Edgewater Resources). The operator for the roller skate rink at Pier 2, slated to open early in 2014, is United Skates of America, Inc. The rink will be used for “roller and inline skating, roller hockey, and roller derby.” Expansion of the Park will continue with the completion of the landscaping of Pier 6, which will open the outer portion of the pier to the public, further development of the Main Street site, and development of the John Street site at the north end of the Park. The former Department of Environmental Protection building at Plymouth and Washington streets in DUMBO “will be transformed into a 1,700 square foot public park building providing much needed restrooms, a community meeting space, an environmental education center and BBP operations space.” Ample Hills Creamery will continue and expand its concession at Pier 5, and Smorgasburg will return to Pier 5 on Sundays starting in April. Finally, in collaboration with Spaceworks, a portion of the upper floors of the building at 334 Fulton Street (corner of Joralemon Street) that houses the Park’s administrative headquarters will be converted into artists’ studio spaces. “Spaceworks anticipates the project will yield approximately 40 affordable studios for visual artists, who will be selected by lottery.” More details on all these projects are here. It is so so cool to live in a neighborhood where developers are anxious to be part of what we all know exist here in this little hamlet across the river. We really get to pick from the creme de la creme of builders. eg Toll Brothers etc. It was just by happenstance that I moved to Middagh/Hicks back in 1980. Truth is, I just wanted a residence close to Wall Street. Now I truly can’t think of a block in NYC that I would rather be, surrounded by many clapboard houses on a tree lined street with a fantastic park with a great bridge entrance just 2 minutes away from my door. Brooklyn Heights is incredible and I don’t ever take it for granted. I treasure every moment. And I know my neighbor across the street agrees, right AEB? When is the marina scheduled to open? I didn’t notice any projection listed. From the wording of BBP’s press release–“Their [Edgewater’s] plan, subject to approval by BBP…”–indicates to me that, although Edgewater Resources’ plan has been deemed the most acceptable of the proposals received, there are still details to be worked out before the final go-ahead. My guess is that the earliest we might expect the marina to be complete is spring of 2016, but that may be optimistic. can you believe that some people opposed the park just a few years ago? What were they thinking? Well, I feel I must inject a bit of skepticism here. The marina is basically a place for rich people to park their boats. The press release says it will have educational programming and such but I suspect parking for yachts will generate more revenue for the facility. Still, on the other hand, boats can be nice to look at – I used to live near the 79th St. Boat Basin and it had a seaside town feel to it. Also, good news that they’re finally planing to finish Pier 6 and things are moving along with Pier 2. And they were against Barclays Center and they were against the bike share program and they were against the pop up pool, and they were against. . . Well, you get the message. There are always the naysayers.